1. The Balfrin Hohenweg from Grächen. (This is tough). 2. 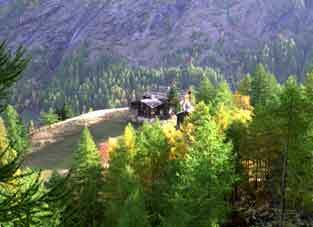 From Brig (3 days) via the Simplon Pass. Otherwise, there is a bus from Visp. you need to know what you are doing! If in doubt, hire a guide. I have done all these walks myself. You need the Swiss Landeskarte 1:50,000, sheet number LK284, "Mischabel". Mischabel is the range of big hills to the West of the village. If you are a climber, you will want to get up there, so the first three pages are not really for you. Try the Alpine options instead. Try the West Col guide for the Pennine Alps. For wintry types, there is a week's skiing. The village has a web site of its own. ...which is now also in English. It didn't use to be! from the village in 1970 photo. 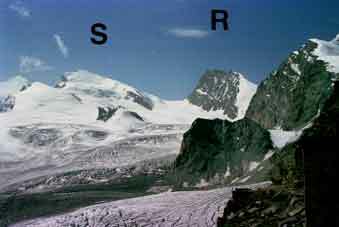 Allalinhorn left & Alphubel right. The long moraine to the right is Spielboden. This is if you get to Saas Fee at lunchtime. Walk South from the village towards Bifig, just before which a path goes SE upwards in zig-zags. There soon comes a choice of going up more zig-zags of a long path to the NE with a huge zig-zag. This is longer. More zig-zags to the Plattja, a good viewpoint across to the Mischabel. There is a tougher path. Cross the bridge in the village & take the path to Saas Almagell. Where this turns left to cross the bridge into Almagell, the tough path goes right straight up to the Plattja. 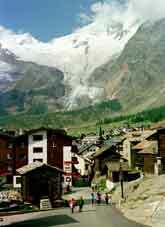 You can also take the string railway from Saas Fee village up the Plattja if feeling lazy. There is a café there. 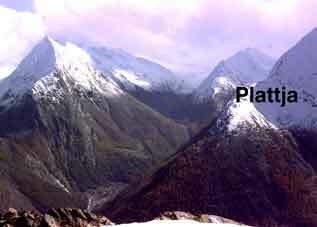 The Plattja in Autumn of 1993 from Mellig. It's not snowy in the Summer. 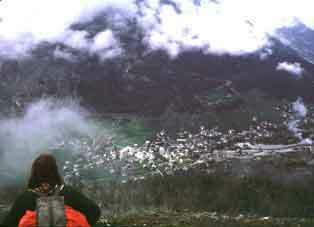 Looking back to Saas Fee from the Plattja on a cloudy day in June 1973. 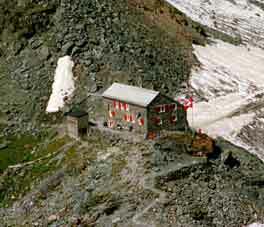 This is an easy walk from the top of the Felskinn Cable Car top station. 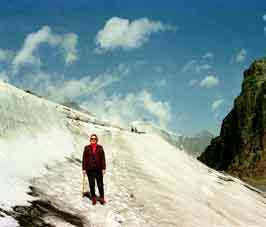 You head South from the station & then East on a marked path across the glacier. Stay on the path or you may be in danger. There is a path from the Plattja (above) but I have only done one-third of it (see Mittaghorn climb). 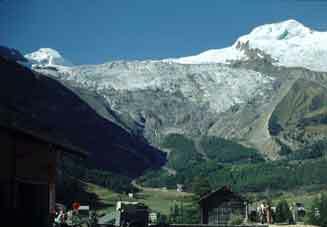 URL: http://www.art-science.com/Ken/Alpine/Saas_Fee/index.html Last revised 14/10/2010 © 2000-2010 Ken Baldry. All rights reserved.